Homemade stir fried noodles to the rescue! This Singapore chow mei fun recipe is quick, easy and so tasty your whole family will ask for seconds! 20 minutes is all it takes to cook this delicious Singaporean dish. Make sure to watch the video! Chow mei fun is my husband’s favorite dish whenever we order Chinese food. If Ben could have it every day, he would. Singapore chow mei fun (or mai fun) – with its curried, smoky and savory flavors… won Ben’s heart that day. And now, ordering Singapore mei fun is a must when we do the Caviar thing. But because Chinese food in New York can get a bit pricey for what you actually get in return, we don’t order delivery all that often. Instead, I’ve gotten into the habit of making my own at home. So good, in fact, that ordering Chinese food is no longer quite as appealing as it used to be. While many restaurant versions are okay, they don’t usually compare to freshly made mei fun noodles. Let’s face it; stir fried noodles are always better fresh out of the wok! Mei fun – (米粉 or mai fun) – sometimes also referred to as rice stick noodles, are thin rice vermicelli noodles. Mei fun noodles are commonly used in Asian cuisine – from Mainland China and Hong Kong – to Thailand, Vietnam, Singapore – and most parts in between. The traditional way to produce mei fun noodles is simply with rice and water. However, sometimes smaller amounts of ingredients like egg, wheat and other starches are added to augment the texture in certain brands noodles. Rice vermicelli that hasn’t been augmented in the manufacturing process is a gluten free food. But it’s important to note that many of the sauces used when preparing Asian noodle dishes contain wheat. Cool fact: rice noodles are usually prepared by soaking in hot water rather than actively boiling them. When preparing mei fun for a stir fry dish, it’s best to slightly undercook the noodles at the soaking stage as they will continue to cook when you introduce them to the wok. However, when making a soup with mei fun, you can add your noodles at the very last step. Once they’re cooked through, you’re ready to put the soup on the table! Singapore chow mei fun, at its most basic, is a stir fried noodle dish that gets the lion’s share of flavor from curry powder. And while there are a ton of slight variations, most Singapore noodle recipes will call for shrimp, pork and veggies – and sometimes a scrambled egg for good measure. Is it Chinese food from Singapore? While the name would have you believe otherwise, Singapore noodles proooobably didn’t originate in Singapore. Shock, gasp… I know! They’re likely Cantonese in origin. So, contrary to its moniker, you’re way more likely to find these Chinese noodles in a restaurant in Kowloon, Hong Kong than in the Chomp Chomp Food Centre on Kensington Park Road in Singapore. Singapore chow mei fun is actually quite similar to a Filipino bihon pancit from an ingredients standpoint – as it’s a simple noodle stir fry with veggies and meats. What makes this Singapore “pancit” different is the use of curry powder. This is a super easy recipe, perfect for days when cooking feels like a chore. While directions will vary from brand to brand, the long mei fun noodles usually require no actual boiling. Just a soak in water. That’s it! As mei fun noodles tend to be quite long – after soaking, I typically cut them down to a more manageable length with a pair of scissors. All that’s left is to add your ingredients to the pan, stir fry for a few minutes and enjoy! For this easy Singapore mei fun recipe, I’ve swapped pork for turkey bacon as a healthier alternative. I find that Chinese food can sometimes be very oily, which can ruin the dish for me. The same goes for lower quality meats that are 80% fat and 20% meat. I would rather omit this ingredient entirely and replace it with something like low fat turkey bacon, tofu or simply add more vegetables. The first step I take when making these Singapore noodles at home is to soak the noodles. Now, I try to make sure that they don’t sit in the water for too long. I want them al dente, as I’ll be stir frying them in the pan with the other ingredients just before serving. Then I get the shrimp and turkey bacon going in a hot pan with a bit of oil. After 30 seconds or so, it’s time to add the cabbage, carrot, red onion, dried red chili peppers and half of the scallions. I’ll cook that yummy mixture for 4-5 minutes. And, hey… don’t forget to stir your ingredients so they all cook evenly! Add your curry powder, stir – and we’re almost there! It’s time for the rice noodles, salt, rice wine vinegar, sesame oil and soy sauce at this point. Mix everything gently, turn off the heat and add some white pepper and your remaining scallions. And, while it’s not necessary to use a wok to make this curry loaded Singapore chow mei fun recipe (a regular sauté pan will do just fine), it’s a lot more fun and effective. You see, the sloped sides are great for conducting heat from a gas range up the side of the pan. So even while you’re tossing the noodles, they’re receiving heat. It’s pretty common to see quite a few ingredients in a curry laden order of Singapore noodles. And, while pork and shrimp mei fun seems to be the industry standard, you wouldn’t be hard pressed to find chicken mei fun or beef mei fun on a menu at some Chinese restaurants in the US. Also, making Singapore chow mei fun at home can present a great opportunity to clear out some of your leftovers from the fridge. You see, as long as you nail the flavor the noodles tend to taste great with just about anything you decide to toss in. It’s not uncommon for me to use this recipe as a clearing house for a ton of veggies before they expire. Just empty the crisper and you’re good to go. A simple vegetable mei fun is super delicious! So fire up the wok and, instead of delivery, make an eat-in feast of all your Chinese takeout favorites at home! Whether you make it with chicken, shrimp, pork, tofu (or all of the above), the smoky and savory heat of this Singapore chow mei fun recipe is always a hit. Did you like this Singapore Chow Mei Fun Recipe? Are there changes you made that you would like to share? Share your tips and recommendations in the comments section below! This is a simplified and better than takeout Singapore chow mei fun recipe your whole family will love. Ready in 20 minutes from start to finish! 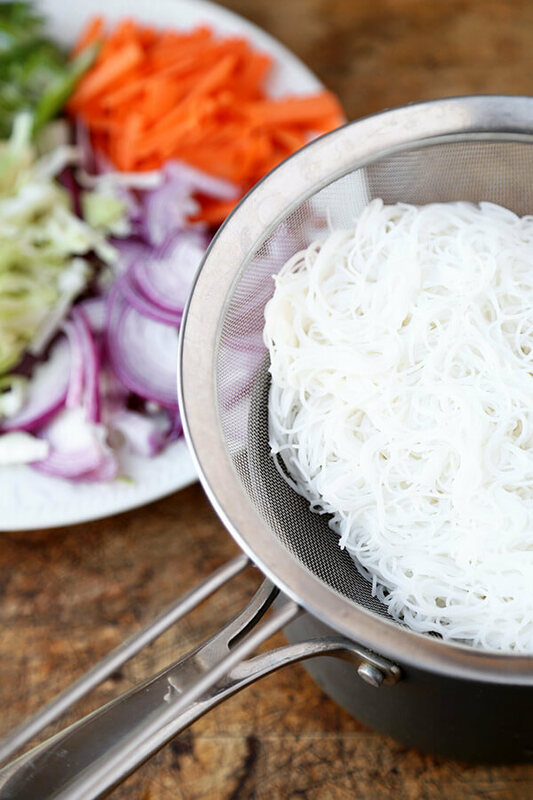 Soak rice noodles in hot water for 7-8 minutes, until they are al dente – you don’t want them cooked all the way through since you will finish them in the wok (or pan). 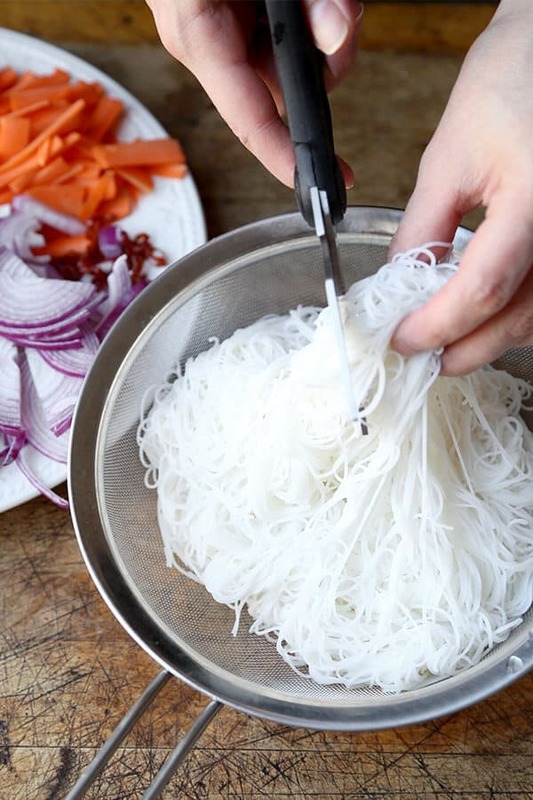 Drain noodles and use scissors to cut them into lengths that are easy to eat. Set aside. In a wok or large pan over high heat, add oil. When the oil is hot, add shrimp and turkey bacon and cook for 30 seconds. Add cabbage, carrot, red onion, dried red chili peppers and half of the scallions, and cook for 4 minutes, stirring often. Add rice noodles, salt, rice wine vinegar, sesame oil and soy sauce, and gently mix. Turn the heat off and transfer chow mei fun to a plate or bowl. Season with ground white pepper, top with remaining scallions and serve. Great recipe. It’s rare a home recipe compares to restaurant Singapore Noodles, but this one does. I made mine with country ham pieces and it was fantastic.. Thanks Jo! The noodles were actually good, it’s the photographer (me) who took too long shooting the images 😉 This unfortunately resulted in broken noodles because they had overcooked. I recommend adding a 1/3 cup of chicken stock at the end, off heat. This is way too dry as is. When I made this it was SO dry and chalky I had to add 1/2 bottle of store bought ginger dressing to make it work. I followed the recipe to a T and it did not taste like a take our version… any insight? Hi Laura, traditional Singapore chow mei fun is dry, it’s only made using spices and contains no dressing. I’m not sure what version you are used to, could it be an Americanized version? I know the food served in American Chinese restaurants (which I grew up on) is very different from the food made in Asia (where I spend 8 years) or served in Szechuan restaurants in NYC. Most dishes are usually a lot sweeter and oilier in the US. Curry powder as in INDIAN curry powder? Hi..I have tried different recipes for Singapore noodles and it never comes out right…what kind of curry powder do you use? I literally get that from take out at least once a week. I’m obsessed with greasy spicy Singapore noodles. You and Ben would get really well haha!